Three years ago, I gave up a career as an IT business consultant for large corporates, earning a six-figure income, to become a full-time author-entrepreneur. Over the last few years, I have shared my income split, business model and my lessons learned from year 1, as well as lessons learned from year 2. Here's the latest installment at the end of year 3. I didn't double my income from last year as planned, but my overall income increased by 24% which isn't bad. I'm not doing a full income disclosure like some brave souls, but I did make over double the average income for a man in the UK in the last tax year. The income split changed as I intended, which is great, as I am moving away from online courses to focus on book-based products, because they are more evergreen and don't need updating. I have followed the plan to write more books and create more products in the world. I currently have five books in the ARKANE action-adventure thriller series, and two in the London Psychic series. The books are available in ebook, print and audio formats. I also have books in German, Spanish and Italian. I've sold books in 58 countries (as itemized by the Kobo Writing Life reporting map right.) I also have four non-fiction books, available in print and ebook formats, and coming soon in audio. There are new revenue streams from audiobooks since ACX launched, and direct payments from Apple and Nook, as well as Kobo and Amazon, plus podcast sponsorship. I'm pleased about that as I have a lot of issues being dependent on one income source – put that down to being laid off during the GFC! One of my books was in a box-set that hit the New York Times and USA Today bestseller lists in March, and I have my first traditional deal with Ullstein-Midnight, a German imprint, for Desecration-Verletzung. I continue to sell some multimedia courses, although those will mostly be phased out in the next year. The blog, podcast and my email list earn me affiliate commission as well as sponsorship and occasional advertising revenue. I do some occasional, exclusive consulting. I also continue to speak professionally both in the UK and abroad. I was on a panel at Thrillerfest in New York in July, and am speaking in Stockholm and Frankfurt in the next few weeks. Here are my lessons learned from the last year. There have been a number of changes in the publishing eco-system in the last year which have created a ‘disturbance in the force,' and distracted me and others. But these ups and downs will continue over our lifetimes. Change is certain but we can't let every little spat distract us from our task. We write books. We get them into the world using one of many available publishing options. We connect with readers. We receive payment and use that money to live well and experience everything that feeds back into our books. The tools, the companies, the technology that allows us to do these things may well change, but our job remains the same. Remaining agile is one key to managing the change, so being indie continues to suit me well. So said my husband when I reviewed the income projections for my books and lamented missing my targets. He's right. I earned three times as much money as a business consultant, but I was so unhappy, I could never have sustained it. I was at the point of crying most days because I hated it so much. I love this author life. I couldn't imagine living any other way now, but although cash-flow is important, it's not my driving force. Freedom is. Freedom to create, to live how I want to, to travel, to help people, to control my time, to build my own brand and my own assets. I've had a number of opportunities this year that I've turned down, even though taking them would have earned me more money. Strategy is about what we don't do, as well as what we do. Desecration was the first book where I finally let my true self out, and Delirium continues in that vein with a very personal author's note at the end. I love my ARKANE series but these are the first books where I feel my true voice shines through. Both books are supernatural suspense/ crime thrillers that tackle underlying themes I've been wrestling with all my life. Many authors struggle with the fear of judgement and I have let that hold me back for a long time. I really am this happy, jolly, smiley girl you see at TheCreativePenn.com … but my shadow side is now revealed in J.F.Penn. I'm finally at peace with letting this other side out … but it's taken many years to get here. I'm ready to let it out now! I'm in a transition phase right now, which means a lot of turmoil and journaling! I have spent the last few years learning how this industry works, learning my craft as a fiction writer, learning about marketing and speaking … and the result of that has been this blog, the podcast and my non-fiction books. I find myself drawn back to creativity, back to exploring what's in my mind, trying to understand how I can delve deeper into my creativity and learn more about releasing it from the critic that tries to destroy every idea. I couldn't even say it out loud back then, but I read it in my head until I could say it. And then I read it out loud every day until I believed it. And then I took action to make it happen. In some ways, I have achieved that affirmation – in other ways, I am only just beginning to understand what it means. I look forward to exploring this and sharing the journey with you! Big focus on primarily fiction. I have a LOT of ideas, I just need to get them on the page. I have a number of stand-alones as well as (working titles) Inquisition and Kali in the ARKANE series, and a new one in the London Psychic series. I also want to write a psychology for writers book. I will continue to focus on exploiting the rights per book, as well as recording more of my own audio. Taking more risks and learning how to keep my critic quiet. My critic is a ‘good girl,' she wants universal adoration. She doesn't like annoying people or going too far to the edge. It's time for her to know her place. I just have to work out how to shut her down in the first draft. I'm definitely intending to do some Improv training, learning how to say ‘yes' to any impulse. Speak internationally on creative entrepreneurship, focusing on fewer, more highly paid events, that support my goals around travel and personal development. Continue to serve the audience of TheCreativePenn.com through blogging and podcasting as well as social media. Increase my income by 30% and change my income split to 50% book royalties, 10% course sales and consulting, 20% commission/affiliate sales/sponsorship, 20% professional speaking. I look forward to sharing the next year with you! Please do leave your comments below and join the conversation – I value each and every one! One of the fantastic things about being an author these days is the community aspect, and the lessons that authors are sharing openly will help you avoid the mistakes we made. In today's article, David Price talks about his lessons learned with his non-fiction book, Open. 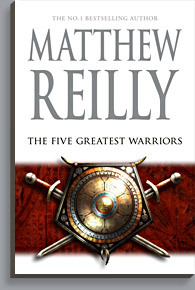 On October 4 2012, my first (and possibly last) book was published on Amazon’s Kindle store. It’s called ‘OPEN: How We'll Work, Live and Learn In The Future‘. Writing it has been the biggest learning experience of my life. I’d like to share the key lessons with you, in the hope that it might help you, the developing writer.. The last time I was immersed in a prolonged creative activity like this was when I was a singer-songwriter – many years ago – and the parallels between the book industry and the record industry, have been both instructive and illuminating. This one I remembered from my time as a songwriter. Record companies were forever asking me to write a song that sounded like, well, whoever was in the charts at the time. After chasing my own tail for a couple of years (by the time you’d got the ‘tribute’ style licked ,the world had moved on…) I realised that whatever voice I naturally had, was lost in the process of mimicry. So this time, I kept a regular blog for two years, before I began to even think about a book. That experience was, and remains, invaluable. Not only does a weekly blog post keep your writing muscles working, your natural voice emerges. I knew, having worked in education, that I didn’t want to write non-fiction for an academic audience. So, blogging’s conversational style suited me, and readers seemed to like it. I once worked with Sir Paul McCartney, and was astonished to discover that he never, ever warms his voice up before performing. I’ve never understood why. Blogging, for me, has been the equivalent of a vocal warm-up. That said, blogging is to writing a book, as sprinting is to running a marathon. I started writing the book after about a year of researching (Evernote, how can I thank you enough?). My blog posts are usually written on the run, but I realised that, to write a book, I'd need a concentrated period, in a place with few distractions, and a daily routine. So, I chose to spend a six-month, self-funded, sabbatical in Australia. It's the equivalent of a band recording an album in the Caribbean, with predictably similar results. The distractions were plentiful, and the book stuttered along. I had a great time, though. I thought authors did all their research and then started writing. But at the point where my Evernote folder had over 500 entries, I couldn't see the wood for the trees, nor how I should structure my arguments. At that point I received an email from another of my mentors, Sir Ken Robinson. “Don't leave it too late, before you start writing” was all it said, and I knew he was right (let's face it, when your TED talk has been seen by over 300 million people, you're always right). So I started writing, with only the barest sketch of a plot or a plan. And in the writing I recognised the book I really wanted to write, and that took me down roads I hadn't anticipated, which then required further researching. I don't know what it's like for other non-fiction writers, but for me the researching and writing have gone almost hand in hand, not one before the other. Having name-dropped, allow me to mention the person who perhaps mattered most in the process: Tom, my ex-songwriting partner. Having the first couple of chapters done, I shared them with Tom, knowing that I'd get a no-nonsense, but sensitive, critique. He encouraged me to put more of myself into the book: my experiences, my stories. When I heard the same from another critical reader, I had to get over myself. This was a key moment, because I'd hitherto assumed that people expected non-fiction to be balanced and objective. Dull, in other words. Tom's most valuable advice – ‘Less is More' – is hardly original, but writers need to be reminded of it, constantly. Confusingly, by this time I'd found an agent, and he felt the first draft needed to be 15,000 words longer. So I kept writing…. Once I'd hit nearly 80,000 words, even I thought it could do with a light trim. My newly acquired publisher, Crux Publishing, assigned an editor. I expected some nip and tucks, but what was proposed amounted to amputation. The version that was published (the 20th draft) was 20,000 words lighter. Taking out those witty diversions felt like infanticide, but what emerged was a tighter, punchier, flow. Handing the manuscript over to someone who will be ruthless in their criticism is crucial, but there were a number of times when I felt my voice was being lost. Unlike my days in the music business, this time I held out. Oh no, you've barely started. When you've lived with a book for 3 years, the process of line and copy-editing is like banging your head against a metallic sharp object. All you want to do is stop. It's tedious, boring and repetitive. I got through it by reminding myself that I now never listen to any of my songs , because I can't bear the imperfect rhymes, or the bum notes being sung/played. I didn't want to repeat that experience. So, once it's up on Amazon, your work is done right? Er, no….. Lesson #8: Build Your Platform, First! If I'd discovered Joanna Penn before I started I would have not only known what a ‘platform' is, I would have had the thing built. The excitement of publication, quickly gives way to the realisation that no-one is going to do the marketing for you. I currently spend at least 2-3 hours every day tweeting, blogging, podcasting…it's relentless. Tim Ferriss likens writing a book to launching a start-up company. I don't like the grind of touting yourself around. But I like the idea of no-one reading my book even less. During the first forty-eight hours of OPEN’s release I watched the Amazon Best Sellers lists in my chosen categories, with giddy excitement. One minute I was ahead of Seth Godin, the next I'd overtaken Malcolm Gladwell I later learned that this was the ‘friends and family' effect of a new book being launched. Elation gave way to despair over the next few days, as the book slid steadily down those lists. II never expected the book to be a best-seller (even by the modest yardsticks of non-fiction) so I stopped looking. Well, almost. Instead, I now appreciate the reader reviews, the lovely tweets, and the emails from people who tell me that my book has changed the way they see the world. You can't put a price on that. Because of social media, I'm directly connected with lots of people who have read the book, and I'm rapidly becoming known as ‘that OPEN guy'. I've been called worse. Don't hold your breath on the follow-up, though. Do you have any lessons learned you'd like to share? Or comments on what David has written? Please leave them below. David Price is a writer, speaker and trainer. You can follow him on Twitter, follow his blog on learning, or buy his book on Amazon. What makes a global corporation give away its prized intellectual property? Why are Ivy League universities allowing anyone to take their courses for free? What drives a farmer in rural Africa to share his secrets with his competitors? A collection of hactivists, hobbyists, forum-users and maverick leaders are leading a quiet but unstoppable revolution. They are sharing everything they know, and turning knowledge into action in ways that were unimaginable even a decade ago. Driven by technology, and shaped by common values, going ‘open’ has transformed the way we live. It’s not so much a question of if our workplaces, schools and colleges go open, but when. Packed with illustration and advice, this entertaining read by learning futurist, David Price, argues that ‘open’ is not only affecting how we are choosing to live, but that it’s going to be the difference between success and failure in the future. I'm currently in the rewrites for my fourth novel, Desecration, which is a departure from my ARKANE series and more of a crime thriller with dark themes. I think I'm starting to find my voice as an author as well as becoming more honest with myself and less self-censoring in what I write. But some things don't change – like the self-doubt that gnaws away at confidence and the fear of being judged. What helps me is hearing from writers who are a few steps ahead on the journey, and recently, I read Behind The Story: Interviews From 20 Self-Published Authors Who Made It Big, edited by Denise Kim Wy. There are a lot of ‘How To' books out there on self-publishing and marketing but I liked this book as it is more of a companion book of interviews with some of the top selling indie authors on writing and marketing. Here are some quotes I found interesting and that resonated with me. Hugh Howey, bestselling author of the Wool series which has sold 500,000+ copies. Sold print only rights in Jan 2013. Regarding my first novel,I wish I'd invested more in editing it before releasing it. I had no idea it would resonate with readers as it did, and I think there's more I could have done to improve it. My best marketing strategy is giving my readers what they want: more good books. So writing the next book is my primary marketing strategy. If it doesn’t have an awesome, eye-catching, starkly colored cover, you’re screwed because no one will see it and no one will know you exist. Heather Killough-Walden, New York Times and USA Today Bestselling author of the Big Bad Wolf series, The Kings series, and The October Trilogy. When I started selling really well, I didn't set up an emailing list, for readers to sign up to get announcements when I had new books coming out. That was something important I didn't do, and lost potential readers learning about future books. * If you haven't set up a mailing list yet, read this article for how to do it. What do you think of the advice above and what specific advice has helped you the most on your journey as a writer – on writing or book marketing? Please share in the comments below. Take control of your own writing destiny. Don't wait for someone to give you permission, don't think someone else will market you, don't take rejection as a lifetime No. Just get up and do it, whatever it takes to achieve your dream! 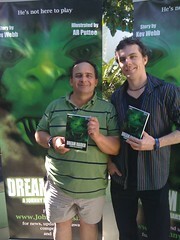 I met up with these guys, Anthony Puttee and Kev Webb, at the Brisbane Writers Festival. They are the authors of ‘Dream Raider: A Johnny Marsh Adventure'. Check out the brilliant cover! I met them on Twitter @JohnnyMarshNet and discovered they are local, so we met up and did a video about the book and what they are doing to market it. Highlights in text are below the video. Have a striking cover aimed at your market. The green monster is brilliant and these large banners had people stopping and looking, including a little boy who was just fascinated. This will stand out in bookshops with the almost luminous green. Plan a series. By sub-titling the book ‘A Johnny Marsh adventure', they are establishing a brand over multiple books which will last longer than just one title. Get started on your marketing earlier. They started 4 months prior to launch, but starting as early as possible is better. Also, go multi-media to reach your audience. Kev and Ant have done a podcast and will do more, as well as giving away free merchandise and online extras at the site. All this takes time to build, but it is worth it for people to find you online. Have fun! The guys are enjoying their journey and having a laugh, as well as trying to sell the book. Their book launch recreated Hollywood with special effects and their energy to succeed is infectious. After all, what's the point if you're not having fun! Keep your day job and work nights on your book. The guys have spent many hours with the book and also the website as well as working fulltime. The book is a labour of love but they are fulfilling a dream! Persistence. It's not in the video, but Kev and Ant have been working on this for 13 years and after a lot of rejection, they went with “partnership publishing”, which is a form of self-publishing with a small press. From what they have learnt, they may go with a print-on-demand model depending on where their sales come from. You can find Kev and Ant at JohnnyMarsh.net where they have a podcast, a blog, free downloads and competitions. If you have kids, you might like to read more about or Buy the Book here!